1998-1999 International Bacheilor of Arts, Switzerland. 2000-2006 Diego Portales School of Law, Santiago, Chile. 2006-2008 The Art Students League of New York. Studied with Knox Martin. 2008-2009 Studio of Art Appreciation, Eugenio Dittborn, Santiago, Chile. 2009-2011 The Art Students League of New York. Born in Santiago, Chile on August 25th of 1981. From her early years she has had strong feeling for arts, developing music and painting. Her art work was approved with the highest qualification in the International Bachelor Program of Arts in Switzerland during 1999. Between 2000 and 2004 She studied Law at the University Diego Portales where she developed a strong interest on philosophy and the sense of justice. Her thesis was published in the Library of the University with highest qualification. On 2006 went to New York to studied Fine Arts at The Art Students League of New York with internationally acclaimed teachers as Knox Martin, Bruce Dorfman and Kikuo Saito, all of them with their work at important Art Museum Collections. Between 2008 and 2014 she made different international exhibitions such as, RYTHM, PRECARIOUS EVOLUTION, THE UNDERGROUND SYMPHONY, WHAT HAPPENS UP HAPPENS DOWN, and BE, all of them based on the ancient hermetic philosophy book, The Kybalion, that show us the 7 unknown rules of the human being.From 2010 she has been studying strongly the essence of human being.The work was shown in Chile, Colombia, United States, England and China. 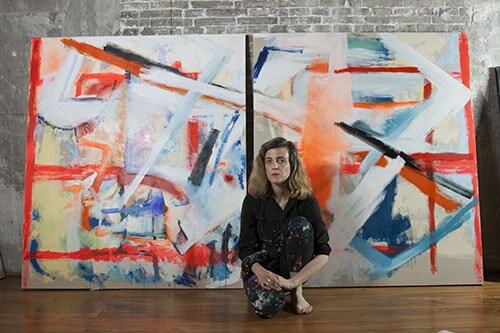 During 2013 she showed in Shanghai a series of abstract paintings inspired on the walls of the subway of New York that reflects the movement of the Universe. With that show she won the well known international residence in Shanghai:The Swatch Art Residence program. She lives and works in New York.Her work is part of several collections, as The Today Art Museum of Beijing, where she had her last solo exhibition called ZERO: THE DIVINE ORDER OF THE UNIVERSAL LANGUAGE. 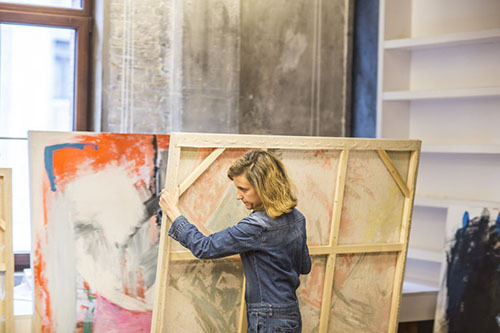 Her perfect use of the strokes, the sensuality of the movement of the paintings, and the smart quality of her statement make her work extremely unique. 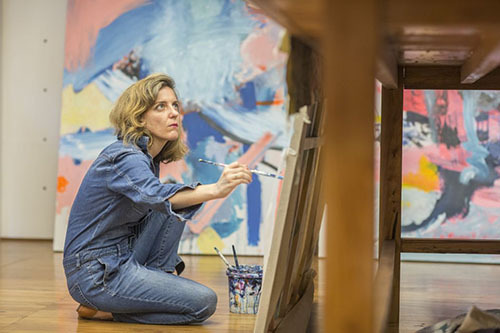 Her mission is to paint what is inside the essence of every human, and her goal, to connect different civilizations in order to bring PEACE, which is her signature, that in Spanish means PAZ. And peace is harmony. And the harmony is the result of the opposites, the place where creation exists.